Registered with the Health Professions Council. The practice of acupuncture has grown rapidly over the years and is now a widely accepted form of treatment for many conditions. the medical profession now acknowledge what the Chinese have believed and practised for thousands of years. Acupuncture is a small part of Traditional Chinese Medicine (TCM). The theory of TCM states that the human body is made up of channels of energy (chi) which must remain in balance for us to remain in a healthy state. There are many point around the body that allow access to the channels of energy and these are called acupuncture points. Acupuncture needles are inserted into theses designated areas to restore balance. From a Western Medicine point of view, research shows that our body’s naturally occurring chemicals are released during acupuncture treatment. The fine needles we use are sterilised and used only once therefore removing the risk of cross infection. The needling sensation can vary from person to person and point to point – warm, aching or tingling sensations are all normal. Skin conditions, weight control, stop smoking, anxiety, depressions, stree, headaches, migraine, stomach, bowl problems, joint, muscular pain, arthritis, lethargy, fatigue, insomnia, hormonal imbalance, tinnitus, frozen shoulder, tennis, golfers elbow, back pain, sciatica, neck pain. Clients are required to have eaten within the 2 hours prior to their appointment time. Needles can be in situ for up to 30 minutes. Tiredness, thirst, light headedness, slight increase in ache, slight change in body temperature, tenderness, mild bruising around insertion point. Some people respond very quickly to acupuncture and notice an improvement within 2 or 3 treatments. Some may require more sessions depending upon the severity of their condition. If you donate blood regularly you may need a certificate to ensure safe practice. Please ask your practitioner about this. Brow Perfect is the revolutionary new eyebrow extension treatment from Lash Perfect. 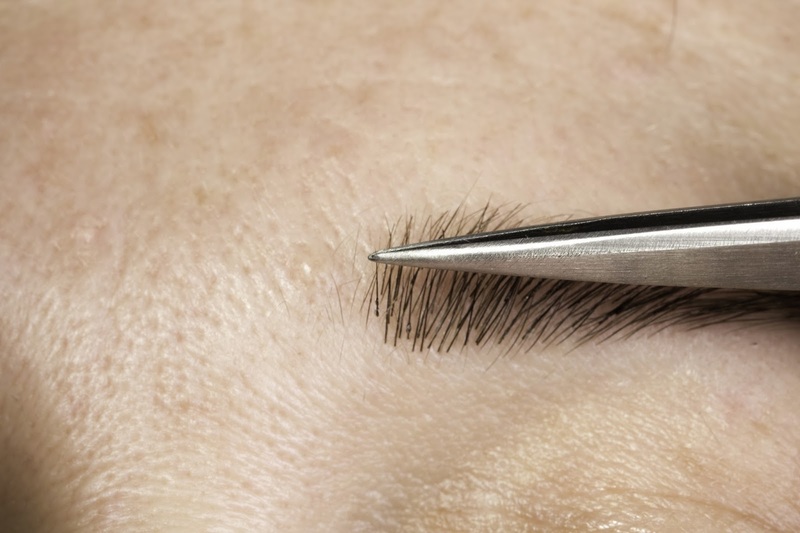 Adhered to either the natural hair or directly onto the skin, eyebrow extensions are used to create volume and fill in gaps to produce the perfect brow. The latest treatment is the Brow Perfect. How does it work? If your eye brows are made of fine hairs or maybe the eye brows are not there anymore for some kind of chemical treatment, Brow Perfect will give a natural look, applying individual brow extension to existing fine hairs or directly onto skin, using and especially created adhesive that doesn’t irritate the skin. 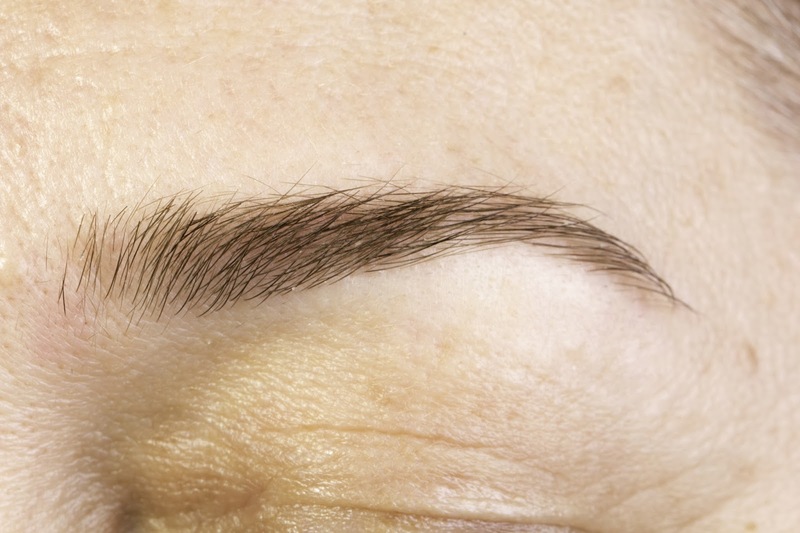 This picture shows the eyebrows before the Brow perfect treatment. 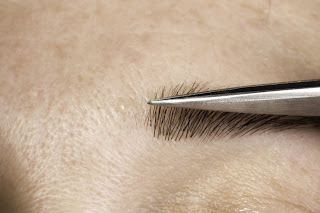 With tweezers every single hair is attached in order to fill gaps or to create a full eye brow. For your first appointment you will need 1hour for consultation & application for just £35.00. Just think of the usefulness of this treatment, a pair of full eye brows can give a lift to the face better than any other chemical treatments and for who went under chemo therapy it would be a moral lift as well while the real eye brows grow again. 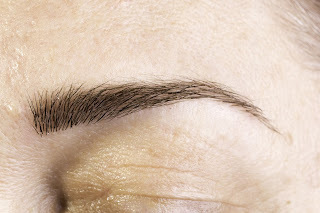 This picture is after the application of Brow Perfect and it has got a natural look. Various colours are available to match everyone’s hair colouring. The application lasts between 7 to 14 days on individuals hairs and 3-5 days on the skin and it can be topped up like the eye lashes extensions. The New Advanced Cellular Enzyme Peel Facial by ESPA is now in the salon. This helps to reduce pigmentation, fine lines and wrinkles, creating an immediate boost. The enzyme peel is made from natural fruit acids and works to remove dead skin cells and boost cell regeneration. This is followed by a deep facial massage and a lifting and soothing mask to give skin a luminous glow. What does the Age Defying Enzyme Peel Facial involve? It’s a 90 minute treatment with immediate results. It starts with a cleanse and steam, then a brush cleanser, and then we apply an enzyme peel. It is followed by an age defying massage for which we use Rose Quartz crystals, then we use a lift and firm setting mask, and finally a moisturiser to suit the guest’s skin type. The treatment gets very deep into the skin, and ingredients are mostly natural, which means it feels very nice as well. The peel contains pumpkin enzyme that helps to exfoliate better than standard products and also helps to plump the skin, while the lactic acid smoothes and softens it. Rose Quartz is used in the facial massage predominantly for its cooling effect after the peel – it also helps to boost circulation and as they are used after an oil, they encourage it to penetrate into the skin to the layers that the peel has already worked on. It is an ESPA treatment, but it contains lactic acid which has been used in treatments since ancient Egypt. We have music in the room and candles, and a heated blanket as the mask is very cooling and we don’t want the client to get cold! It’s all designed to encourage relaxation. The peel can tingle a little as well, so we check that with the client throughout the treatment and remove it if it gets uncomfortable. Pre and post treatment we recommend that clients don’t exfoliate for a few days before and afterwards. Make sure you have not had a peel in the previous 28 days, try not to put make-up on for the rest of the day, and wear an SPF moisturiser when you go outside after the treatment. As we can adapt the treatment a lot, it is recommended for most people. It is especially good for people with acne scarring, because of the plumping effect, and also to counter the signs of ageing. It isn’t suitable for women who are pregnant, or for anyone suffering from any serious illnesses because the peel is very stimulating. The mask also contains seaweed extracts, so if you have any seafood allergies then it’s important that you let the therapist know so that we can adapt the products. This lipstick combines the transparent colour and shine of a lip gloss with the creamy texture of a lipstick. A unique extreme shine Maxi Lip Complex helps plump and hydrate for full, soft and supple lips, while the deeply moisturising and long-wearing formula provides the benefits of a balm with lip care ingredients. Very easy to apply thanks to it supple texture. For a more sophisticated effect, start by defining lips with Lipliner Pencil before applying Joli Rouge Brillant with a lip brush. A new generation gloss combining incredible shine, intense colour and lasting hold. Its highly smoothing, gel-like texture which is non-sticky and shapes lips, coats them in a veil of softness and comfort. Choose from eight shades which boost overall facial radiance and enjoy their delicious flavour with notes of blackcurrant and liquorice. Using the foam tip, apply the fine, non-sticky gloss generously and precisely onto lips: the lips are coated in a veil of softness and comfort, with long-lasting shine and colour. • The new High-Lumitec Complex brightens the complexion and optically corrects imperfections. • Available in three shades – rose (brightens all complexions), champagne (corrects redness) and peach (restores lustre to medium and matte skin) – leaving a veil of light radiance that evens skin tone, boosts luminosity and restores skin’s vitality. • Fast and easy to apply: in just a few seconds, the complexion is naturally luminous and skin recovers its vitality, freshness and suppleness. Apply alone, after your regular day cream or mixed with your foundation. A lightweight cream blush that transforms into powder upon application. Four easy to apply shades. • Its creamy and soft texture melts into the skin to sculpt, smooth and add a hint of colour for a light, natural-looking finish. • Floral waxes from rose, mimosa, jojoba and sunflower pamper the skin and protect against dehydration. • Adds lustre to the skin with the Clarins exclusive Light Optimizing+ Complex. A vibrant palette of illuminating shades in silky, long-wearing mineral textures. • Highly pigmented mineral eye shadows to brighten any look. • A harmony of four easy to blend satin and iridescent shades: opulent pink and grey to create definition, intense plum shadow liner for a touch of vibrancy and a pearly white highlighter to brighten. • Illuminating, long-wearing eye shadow. The ultra-fine texture of the eye shadows was carefully crafted to allow every mix and every shade possible. Apply dry for subtle, natural look or with a slightly damp applicator for a more intense, vivid colour effect. Firmly Established as the No.1 Anti-Ageing Serum in the UK, Clarins continues to support Double Serum with a primary focus on the counter, introducing a new 50ml size at a great value price.